It’s no secret to anyone that the Vegas Golden Knights are the most popular item in Las Vegas right now. Show up to a game, there are routinely 18,000+ people wearing grey and gold. Drive down the street and you’ll see thousands of VGK decals, stickers, plate holders, and now even custom license plates. You can go pretty much anywhere in this city and you are almost guaranteed to see the Golden Knights logo somewhere or on someone. But the best determinant of actual fandom is eyeballs. By that I mean, people watching the games on TV. Last year the numbers were very hard to come by (believe me, we asked over 20 times over the course of the season), but as the regular season came to a close, Sports Business Journal was able to gather the average number from the season. For context, the league leader was the Pittsburgh Penguins with a 5.81 rating, the Buffalo Sabres came in second at 4.62 and the St. Louis Blues pulled a 3.93. The worst ratings in the league were by the Anaheim Ducks (0.24) and the Florida Panthers (0.27). Before I show you the numbers for this year, let me explain TV ratings quickly. The numbers above, called “ratings” indicate what percentage of total households with televisions (whether turned on or not) are watching the channel. There’s another metric, called “share” which indicates the total percentage of households have that actually have TVs turned on which are tuned to a channel. So, on to the fun numbers. Here are the Golden Knights ratings per game on AT&T SportsNet this season. I remember hearing all the negative comments about Golden Knights defenseman Nick Holden’s play the first month of the season. He turned the puck over. He was out of position. He added nothing to the offense. And a lot of it was true. But I also knew that it takes players time to adjust to a new team, a new system and living in a new city. Playing in a different division and conference also factor into the break-in period. So I was preaching patience. But I’ll admit, my patience with the 31-year-old Holden was being tested. Here was an NHL veteran who was in his eighth season. I was expecting better. Not a whole lot better, mind you, but better than what I was witnessing. The last few weeks, Holden has restored my faith in the free-agent signing George McPhee made on July 1. He has ramped up his play considerably and he has found a home on the third defensive pairing with Colin Miller. The biggest adjustments are learning the idiosyncrasies of your teammates, finding your role and comfort zone with your personality in the locker room and understanding what your coach wants and assimilating yourself in the team’s system and style of play. When Nate Schmidt was serving his 20-game suspension, Holden was playing with several different partners. It was a difficult adjustment. Little things like which side of the ice you’re playing (Holden’s a left-handed shot), to knowing the speed of the forwards to headman the puck to them to simply having a feel for how the puck is passed to you can all contribute to a player’s comfort (or discomfort) level. But if you look at Holden’s play the past couple of weeks, you’re seeing the player McPhee thought he was getting. He’s reading the play better. He’s making smarter decisions when to jump into the attack and support the play. He’s picking up the opposing forwards better in his own zone and using his stick better to get into passing lanes and clear rebounds from in front of the net. It was also the hardest night of the season, emotionally speaking. The NHL’s 31 teams all celebrate “Hockey Fights Cancer” during November. It has been going on for 20 years now and has raised tens of millions of dollars for cancer research. From the special lavender jerseys the teams wear in warmups and are ultimately auctioned off, to the inspiring stories we hear throughout the league, to the signs fans hold up in arenas proclaiming who they “Fight For,” it’s one of the best things the NHL does. Who among us hasn’t been impacted by cancer? Whether it was yourself, a family member, a friend, cancer doesn’t discriminate. Man or woman. Rich or poor. Black or white. American, Canadian or Russian. Cancer can get any of us. We’ll get to how it got me in a minute. But first, I wanted to applaud Kendell Galor, who was honored in the pregame ceremony. Kendell is a member of the Golden Knights family along with the UNLV hockey family. She is a strength and conditioning intern for the Knights and she is the trainer for UNLV’s hockey team. Colin Magdon is also trying to win his battle. The 7-year-old who plays for the Junior Golden Knights, has leukemia. He recently had his first round of chemotherapy and his fight is well under way. I hear these stories about young people and cancer and it breaks my heart. Last year, the Knights visited the Nevada Childhood Cancer Center in Henderson to spend a couple of hours with kids who are waging a brave battle against cancer. To a man, every player who visited and spent time with those kids that day said it was one of the most rewarding experiences of their lives. And remember, many of these same players the month before were in the community supporting the victims of the October 1 mass shooting. It’s days like Saturday where sports and the community can bond, where we can be there for each other, where we can raise awareness for a cause that is worth fighting for. 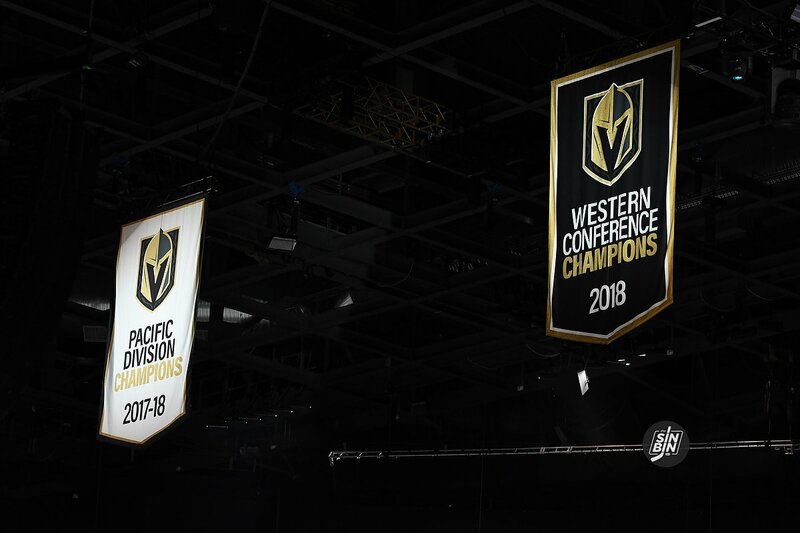 And while everyone wants the Golden Knights to win on the ice, sometimes, getting a little perspective is even more important. 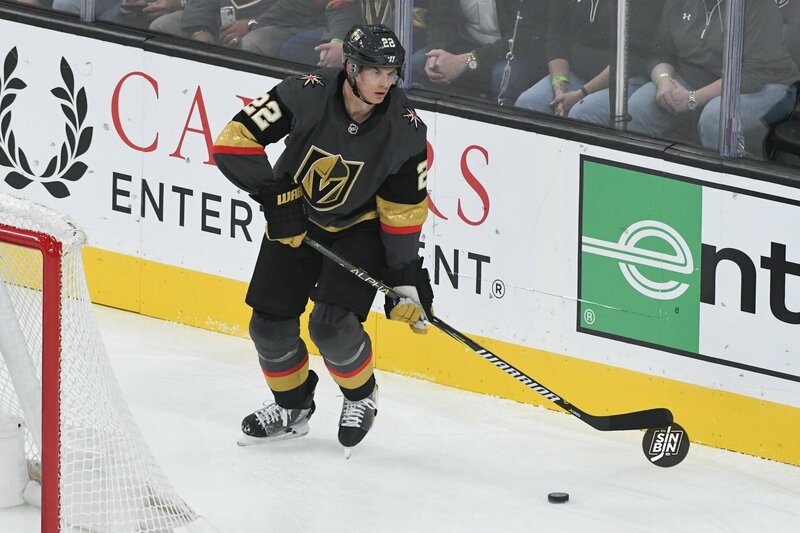 Because as much as a win Saturday against San Jose will bring a smile to Colin Magdon’s face or make Kendell Galor feel a little better as she drives home from T-Mobile Arena, the fact they know people care about them and want to help them is more important than two points and a .500 record. Last night the Golden Knights held the annual “Season Ticket Holder Event” in which more than 4,000 season ticket members showed up to Mandalay Bay to paint VGK logos on canvases provided by Pinot’s Palette. While the fans were painting, the entire Golden Knights roster showed up to sign autographs, take pictures, and chat with the thousands in attendance. It was as unique as a “hockey” event can possibly be. When the event ended season ticket holders were given their 2018-19 member box. (Pictures at the end of the article) It’s become a tradition the team intends on continuing for at least the first five years. In that box was a tiny glass vial filled with the water that made the ice at T-Mobile Arena last season. Like anyone, I saw the vial and had questions, is it really the actual water and if so, what are the logistics of making this happen? So, like any good blogger professional writer I found the answer, and yes, it really is the water. If you thought you drank too much coffee, then you’ll enjoy this great anecdote from NBC Sports’ Pierre McGuire. The ‘Between the Benches’ analyst joked about bumping into a fully caffeinated George McPhee at an early Vegas practice in Washington. 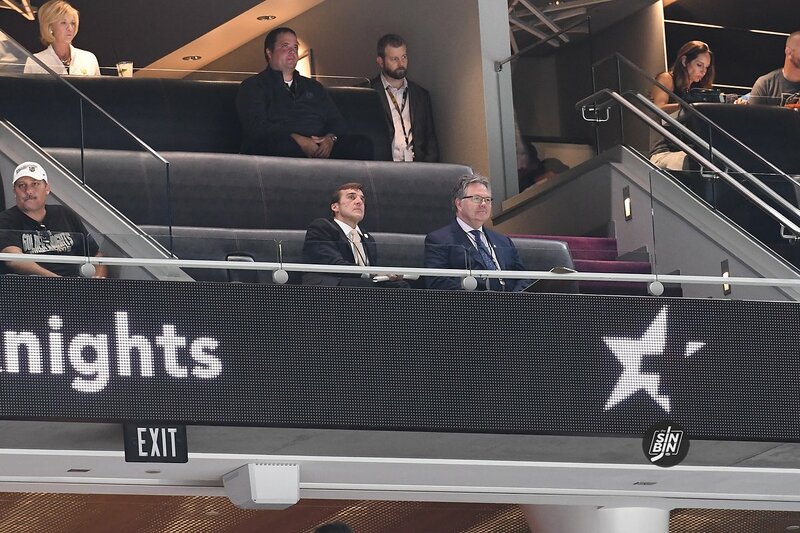 When an award-winning GM and a high-profile hockey personality are casually sitting together, you’d think they’d be talking about something important. You know, like VGK’s PP deficiencies or highly rated prospects like Erik Brannstrom. Nope, the two spent time together talking about what was in McPhee’s cup. Everyday jamokes like me, can’t function without a hot cup of joe, and with all of the pressure being an NHL general manager brings, McGuire was floored by McPhee’s newest (off the ice) discovery. 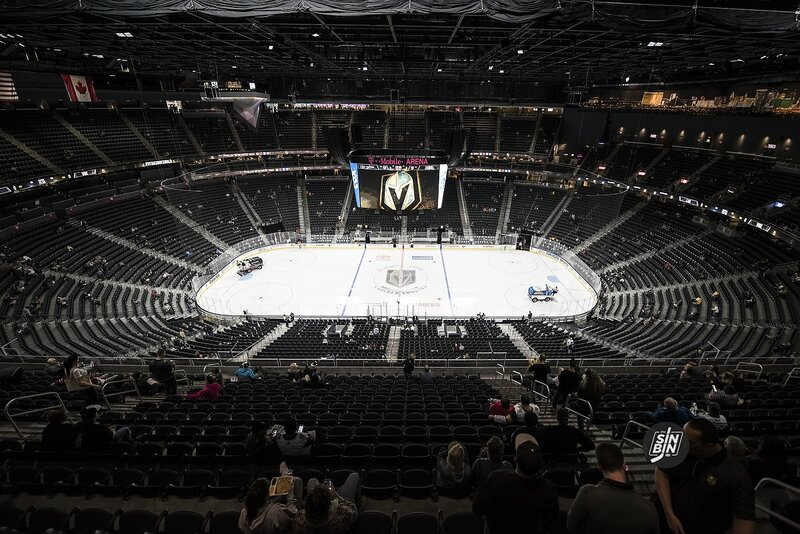 Last year the Golden Knights offered a program called VGK University in which fans were able to skate at T-Mobile Arena, get tickets to games, and attend classroom sessions taught by Senior Vice President Murray Craven and Director of Hockey Operations Misha Donskov. The program sold out quickly and the response from those who attended was tremendous, which is why VGKU is back this year. 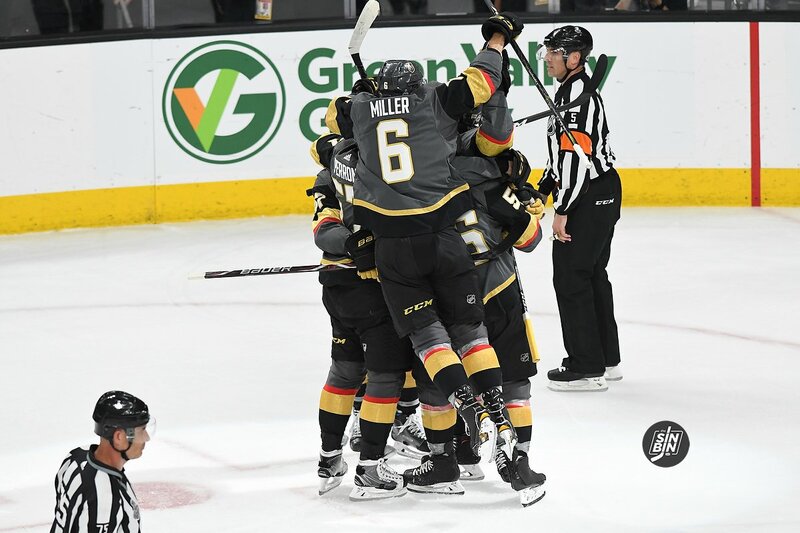 Obviously, the highlights are skating on the ice at T-Mobile and attending games, but take it from me, the part that will stick with you more than anything else from VGK University will be the Hockey 101 sessions. 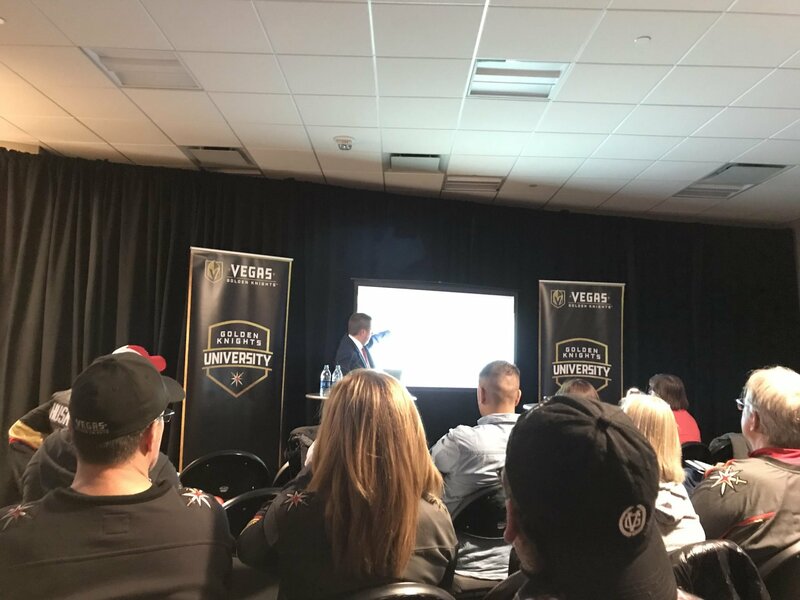 Last year I was given the opportunity to sit in on a session of VGK University, and to say the least, I was blown away with how great it was. Misha and Murray go incredibly in-depth teaching the game mainly through video. They illustrate principals of the game, then show video clips to bring them to life. You can’t see the screen, but in this picture, Donskov is explaining exactly where each player is supposed to be when the opposing team dumps the puck into the zone describing the players as F1, F2, D1, etc. And not a single person in the room was confused. That’s what you get from VGKU. The classes begin fairly basic but progress into much deeper concepts including things like forechecking strategies, defense to offense transition, and penalty kill structure. No matter who you are or how long you’ve been watching (or even playing) hockey, you’ll learn something in these classroom sessions. Dosnkov is a former video coordinator/hockey analytics coordinator for Team Canada. He’s also been an assistant coach for three Canada gold medals (2016 IIHF, 2015 IIHF, 2015 World Juniors). Craven played in the NHL for 18 seasons scoring 266 goals and tallying 759 points in just over 1,000 games. In other words, when combined these guys have forgotten more hockey than most current NHL players know and they are sharing that knowledge with you at VGK University. 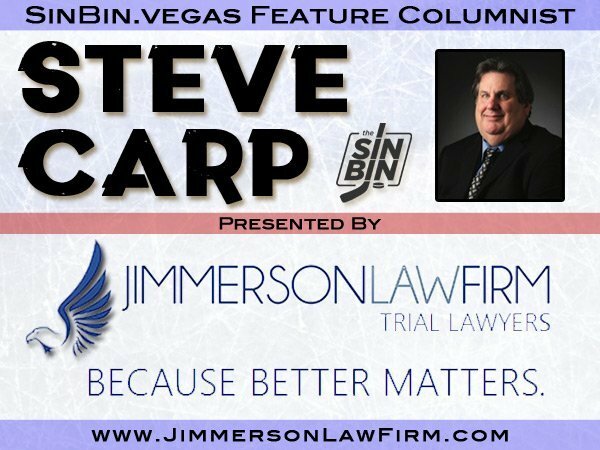 Not only does the valley’s best personal injury attorney, give away tickets to every game on Facebook, but now Adam Kutner is giving away a pair of tickets to one fan on Twitter every time the Golden Knights score on a power play. All you have to do to play is tweet @AdamSKutner and use the #AdamKutnerPowerPlay right when the Golden Knights get the man advantage. One random tweeter will be picked for every power play, and if the Golden Knights score, that person wins a pair of tickets to an upcoming home game. Last year the Golden Knights had 248 power play opportunities and scored on a whopping 53 of them. If the Adam Kutner Power Play Give Away existed last year, that would mean 106 tickets given away to VGK fans on Twitter! Oh, and if you ask me, the power play is better this year than it was last year. So, get ready to tweet when you are watching the game because the contest will come quick. Right when you see the ref’s arm go up, send a tweet to @AdamSKutner and use #AdamKutnerPowerPlay. Recently there has been a lot of noise about the decision of the Golden Knights to cancel the tickets of certain season ticket holders. A few reported stories have sparked questions and in many cases fear for current ticket holders that they could be next to have their tickets canceled. We sat down with Todd Pollock, VP of Ticketing, and Kerry Bubolz, Team President, to help try and clarify the situation. Both Bubolz and Pollock answered questions, but their answers were combined to avoid any confusion. What is the policy and has there been any change in the policy that has led people to have their tickets revoked? This policy has been in place since Day 1. We formulated membership agreements almost three years ago, so this has always been an expectation that people will sign and follow the rules, it’s not like all of a sudden we got good and we’re arbitrarily making decisions. People first started signing the agreement around November of 2016, and to date, we are at 100% of members that have signed it. There are a couple of things that are key in the agreement. One is that people are buying season ticket memberships with the intention of being a fan and not for financial gain. That is clear as day in the agreement. The second notion is that the team will offer a secondary resale market option because we do not expect everyone to go to every game. The agreement states that they must use our secondary site option. Last year it was StubHub, but we are no longer working with them so we are utilizing the Flash Seats marketplace this year. That’s the biggest change in relation to where people can sell. When were the first seats revoked from users? Not until June, July, and August did we start pulling seats. We gave everybody the benefit of the doubt. They had 55 home games to show us what they do with their seats and now we have the data and we can go ahead in making fair decisions. We were looking at it throughout the year and along the way, there was some communication. When was the first person warned that their seats may be revoked? It was near the end of the regular season. So no one lost their tickets in November? Did anyone even lose them before the playoffs ended? There were a few but they were blatantly abusing. Double-selling and such. That was very much few and far between. What is the main reason you don’t want people to sell tickets? People can sell. They are absolutely permitted to resell. They do have to use the secondary marketplace that we’ve authorized them to use. That’s the policy because it’s the only way we can guarantee the authenticity of the tickets that are being sold. Why is it not acceptable for people to sell on Facebook? Golden Knights Trivia Game: Who Am I? With the season opener just about a day away, we decided to have a little fun with you and play some trivia. We’ve put together a group of “Who Am I?” questions. We’ll give you a fact about a player, and you have to guess who it is we are talking about. I’ve played a total of 154 NHL’s games, including playoffs but tomorrow will be my first opening night. Who am I? My first NHL game was on opening night. I played great but my team lost. Look, we weren’t very good that season but we still had one of the greats on the team. We added another great the next year. We’re all still good buddies. Who am I? Neither of us were drafted by the Bruins but Torrey Krug and I shared our first opening night game in 2013. Who am I? I’ve been in Gerard Gallant’s opening night lineup for three straight years. I scored the first goal of the game in my first opening night appearance. Who am I? In my first opening night game, my teammates Taylor Hall and David Perron registered a point. Surprisingly I had the most shifts on the team. Oh and opponent Deryk Engelland had roughly the same amount shifts. Who am I? In my first opening night game, I played 3 minutes but spent more time in the SinBin for fighting Zack Stortini. I better get more than 8 minutes on Thursday. Who am I? My first NHL game was on opening night. I had a second period roughing penalty. On my second opening night I scored a goal. In my third opener, I had a goal, an assist, a roughing penalty, a spearing penalty and a game misconduct. It was an interesting night. Who am I? 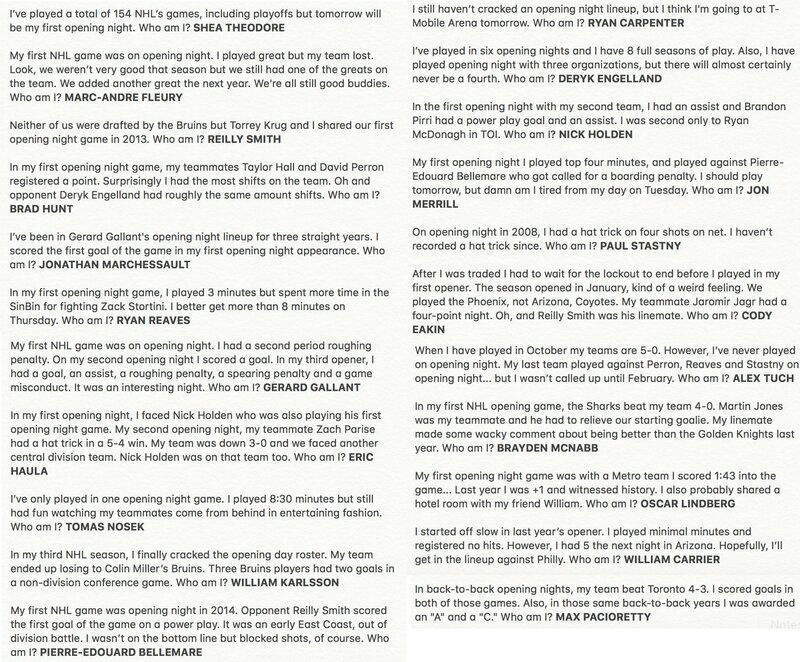 In my first opening night, I faced Nick Holden who was also playing his first opening night game. My second opening night, my teammate Zach Parise had a hat trick in a 5-4 win. My team was down 3-0 and we faced another central division team. Nick Holden was on that team too. Who am I?